This square book with a silky feel to its cover is a lovely example of Vivian French's skill in telling a simple, funny, positive story beautifully. 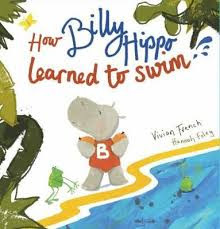 ... but of course it does the trick, and soon Billy is swimming and swirling and wallowing in the water, and declaring, "I love swimming!" 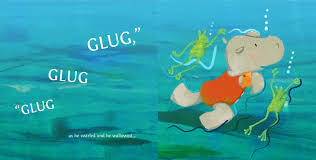 A lovely book to share with small people, especially those just trying out swimming for the first time. Hannah Foley's lively pictures are full of feeling and fun. And publisher Little Door Books give a link to their website where you can access and download a free audio-book as well as some specially written songs. That makes a lovely package for teachers or parents to use along with the book.